HP Roofing highly recommends the Duro-Last roofing system. As a Roofing contractor for NH VT Upper Valley area we understand the problem with flat roofs in the winter. The surface of the Duro Last system is so slick that snow and ice can be removed with a broom. We have found this product to perform exceptionally well on older homes where the issue of some puddling occurs, Duro Last has no problems with standing water as the material performs almost like a swimming pool liner, but many times tougher. The Duro Last system can be installed over current roof. Our Qualified roofers will inspect the existing roof for presence of moisture. If none is found, we then install an underpayment of 1/2 foam board to protect the Duro Last membrane from exposure to the old roofing material to protect your warranty and enhance the insulation on the roof. Features and Benefits of Duro-Last vs. asphalt roll roofing. Installation is less disruptive. You will hardly know we are there. No loud machinery, no noxious fumes, no potential damage by rain getting in during installation, no messy splatters of tar to clean up, can be installed in less time saving labor cost and intrusion to the home or work space, or classroom. 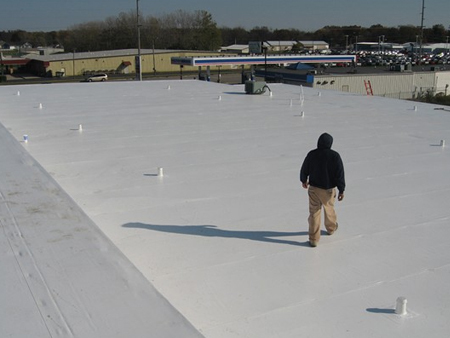 The Duro-Last roofing system membrane is a proprietary thermoplastic formulation consisting of resins and plasticizers, stabilizers, biocides, flame retardants and U.V. absorbents. A weft-insertion knitted scrim that is laminated between two layers of film gives the membrane its strength and durability. 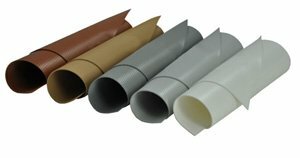 The Duro-Last membrane is available in white, tan or gray. Duro-Last can also be painted. See the General Specifications for details.